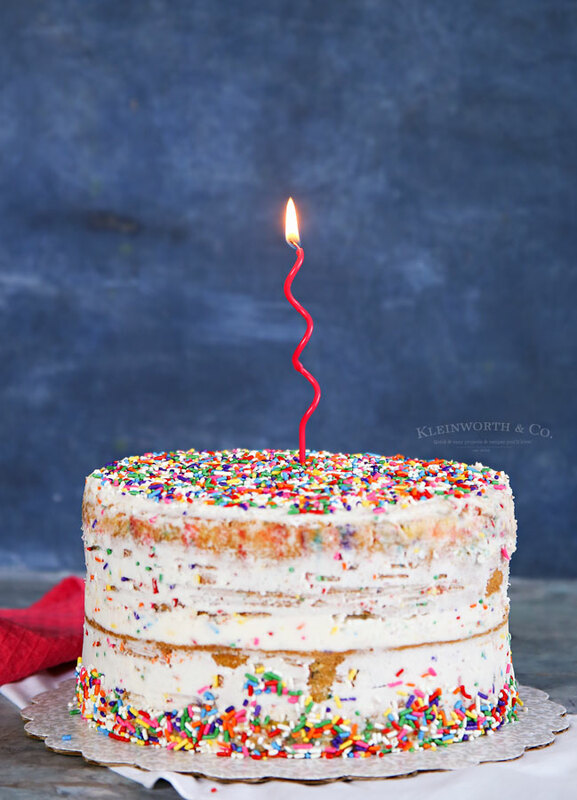 If you swoon for the bright colors of Funfetti, then you will love this adorable Homemade Funfetti Cake. 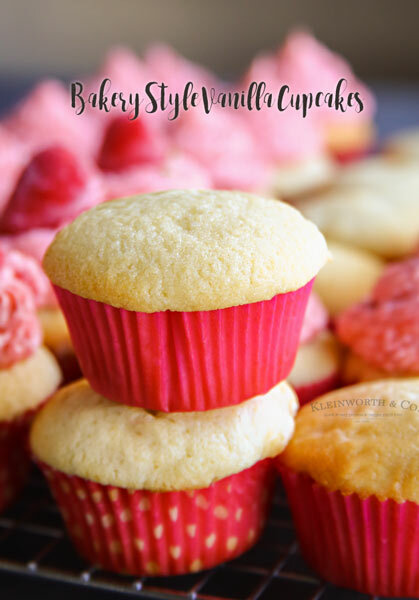 No need for a box mix, this recipe is quick & easy! 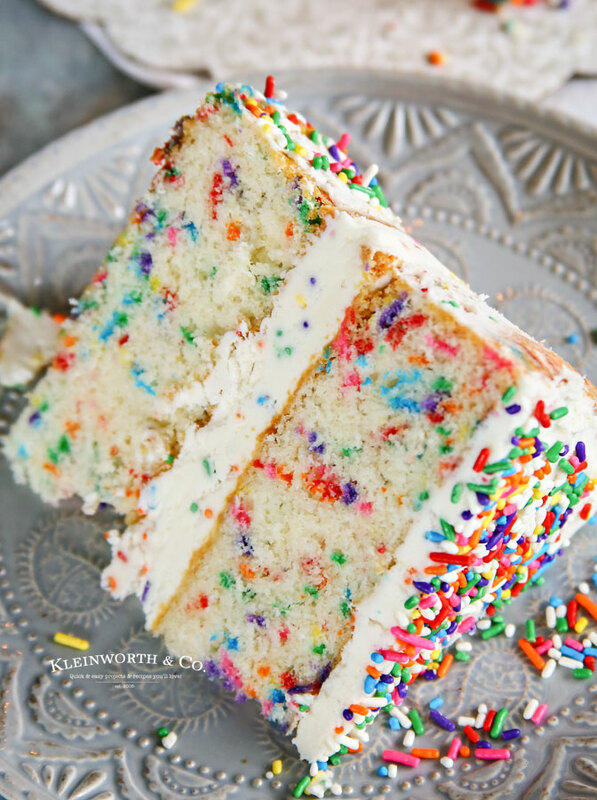 I absolutely adore the colorful sprinkles in Funfetti. It just makes me happy. 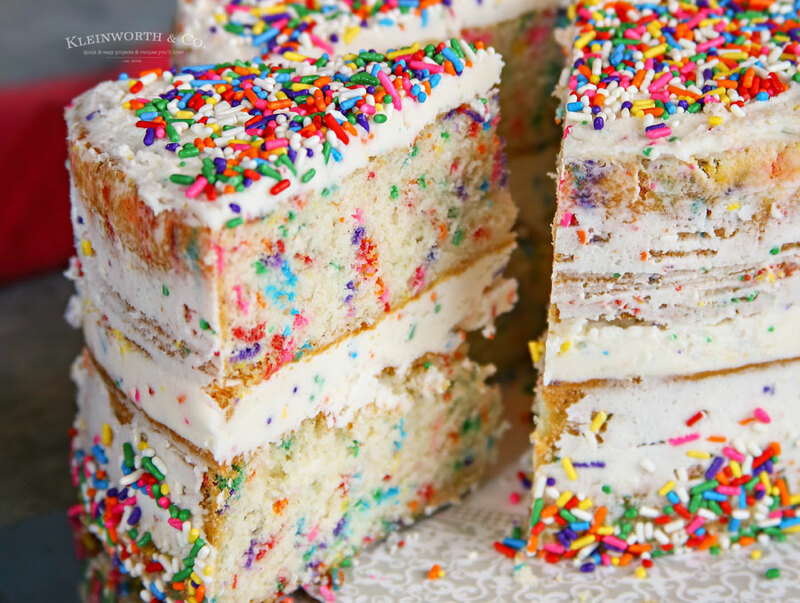 I mean, how could sprinkles in all those pretty colors not make you smile? 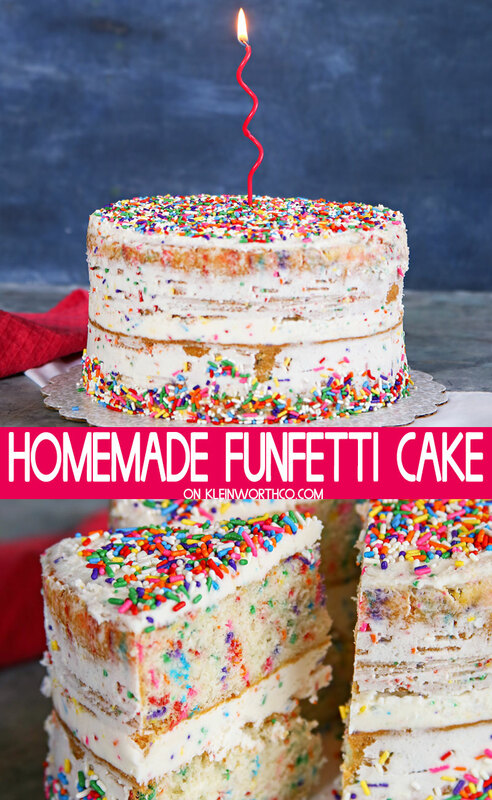 I love them so much I decided that I really needed to whip up my very own Homemade Funfetti Cake. You see, ever since my mother passed away a few years ago (I honestly can’t believe it has been that long already) I have continued to celebrate her birthday by making a cake for her. I know that seems a little strange. But hear me out. When I was a little girl she decorated cakes professionally. Over the years she moved on to other things, but our happy times still revolved around cake. So it is completely fitting that whenever I need to feel close to her again or commemorate her on her day – that cake is the focus of the day. I have made it my mission to try something new when it comes to cake each year for her birthday. 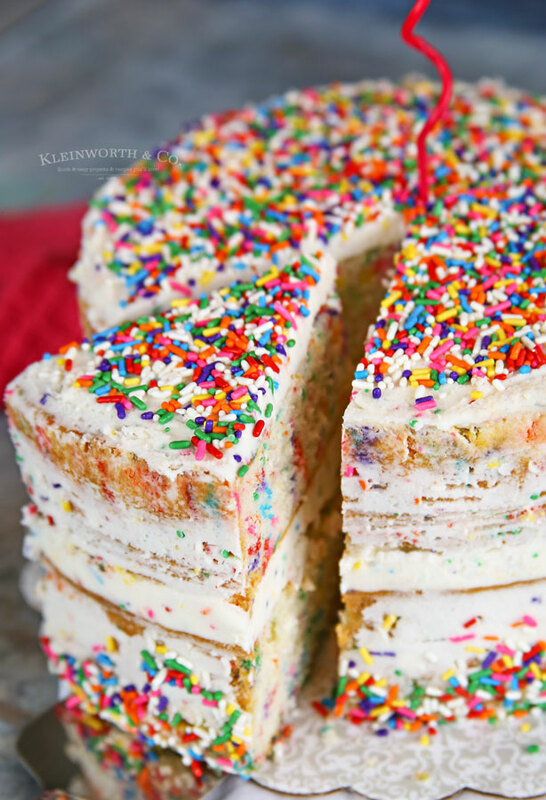 For this, I took her basic white cake recipe & altered it a bit & then added the rainbow jimmies. I was quite pleased with the result. How long do I bake this cake for? I start out by setting my timer for 30 minutes. Then I check the cakes in 4-minute intervals after that. But I typically end up at about 40 minutes when I’m pulling these out. You know they are done when you press on the center & it springs back. Do I really need to grease & add parchment to the pan? Yes – please do this. I usually grease the pan, add a cut round piece of parchment & then grease over that. The cakes pop right out, no sticking. 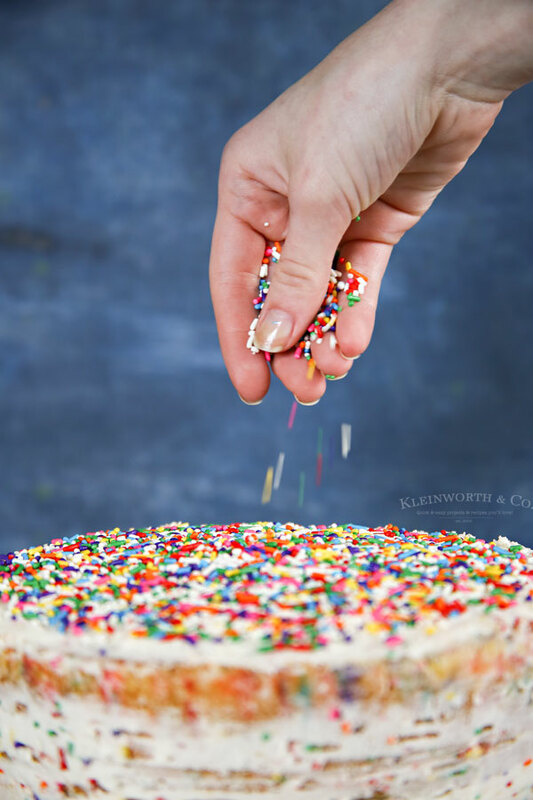 When working with the jimmies in the cake batter, you really want to make sure you do this because they WILL make your cake stick to the pan if you don’t. Then you’re just eating the cake out of the pan with a fork because it’s not going to be pretty. I’m not saying that is a bad thing, just probably not what you want. Why do my ingredients need to be at room temperature? This is important. It helps things blend nicely & form an emulsion which traps air. While baking in the oven, that trapped air expands and produces fluffy baked goods. 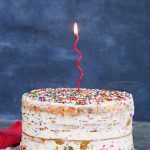 What’s with the naked cake? 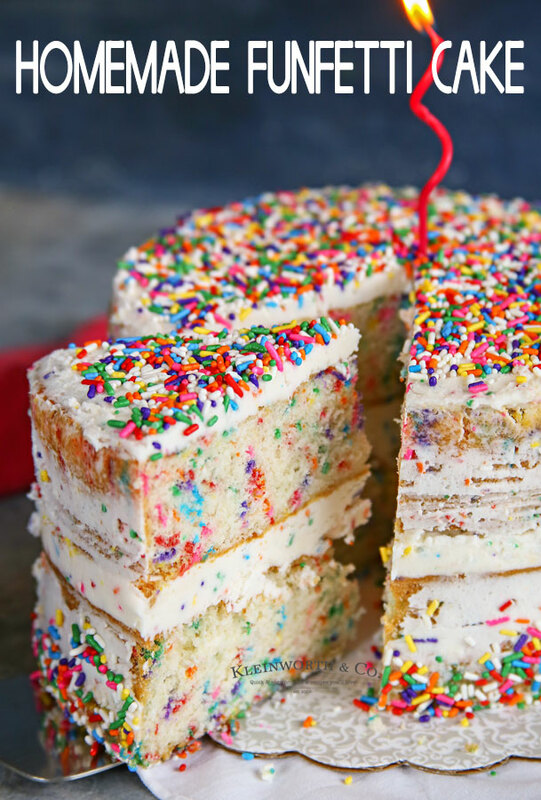 Can I frost/decorate the whole thing? 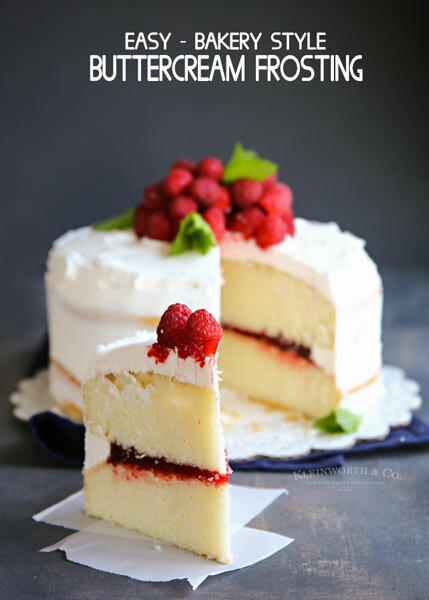 I happen to love naked cakes. 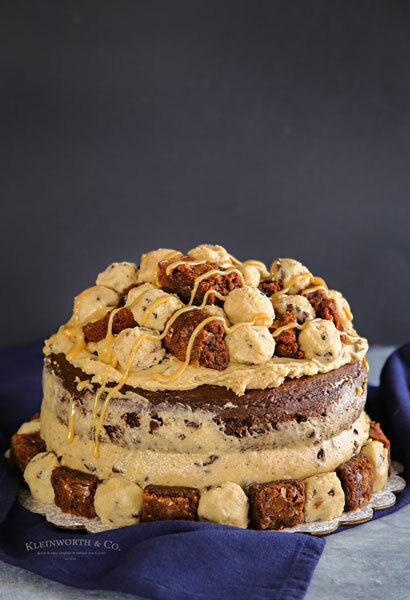 The more “naked” the better because I really love the flavor of cake more than the flavor of any frosting. So that is just my preference. You can absolutely frost this cake however you like to fit your preference. This was absolutely delicious & mom would have LOVED it. 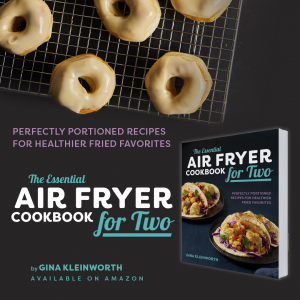 Stay tuned for the Cake Batter Frosting recipe I paired with this – I’ll be posting that soon. In a large bowl, sift together flour, sugar, baking powder & salt. That looks amazing! I love the rough icing! What a fun cake! I will have to request this for my birthday next year! This is making my mouth water! I’m sure it’s 10 times better than the boxed stuff! Thank you for sharing at the #HappyNow link up! The Cake is beautiful and would I am sure be delicious! Hope you are having a great week and thanks so much for sharing your awesome post with us at Full Plate Thursday! that looks delicious and pretty!